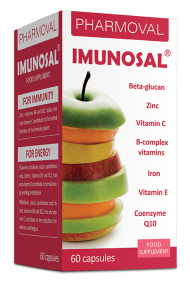 Imunosal® capsules with beta-glucan, zinc, iron, coenzyme Q10 and 10 vitamins. Take 1 to 3 capsules daily on an empty stomach. If you have problems with sensitive stomach, take the recommended dose with meal or consult your pharmacist or doctor. 1) Zinc, vitamins B6 and B12, folate, iron and vitamin C contribute to the normal function of the immune system. 2) Thiamine, riboflavin, niacin, pantothenic acid, biotin, vitamins B6 and B12, iron and vitamin C contribute to normal energy-yielding metabolism. 3) Riboflavin, niacin, pantothenic acid, folate, vitamins B6 and B12, iron and vitamin C contribute to the reduction of tiredness and fatigue.